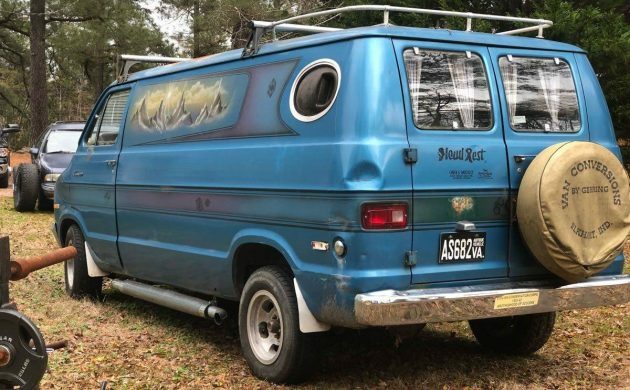 This 1974 Dodge Van looks like a potential bargain at just $3,595 for a running, driving “boogie” van with awesome period graphics and an interior straight out of the disco ball era. 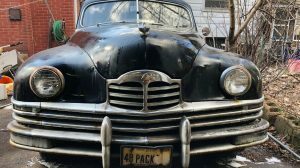 The seller notes that the Dodge benefits from a rebuilt carb and there’s no obvious rust or body damage visible in the pictures. And it has a mural! 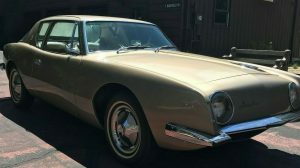 Find it here on craigslist in Richmond, VA, and thanks to Barn Finds reader Miguel for the find. The Dodge also has side-exit exhaust and a period set of roof racks. Chrome bumpers still gleam nicely, and the the spare tire cover suggests this van may have been professional converted way back in the day. The mural on the side is a must-have for a van of this design and era, and despite the dent in the rear left side, the van’s cosmetic condition looks perfectly adequate for a driver. 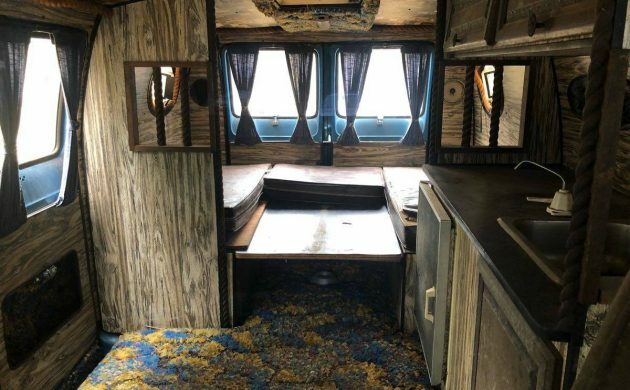 Inside, you’ll find the full assortment of wood paneling, kitchen-in-miniature, and funky carpeting that are all considered must-haves for a van of this era. The seller doesn’t elaborate on the origins of the conversion inside, but it looks to be done to a fairly high level considering how well it is holding up. The back of the Dodge provides some sleeping quarters while the mid-section will allows for the basics of hand washing and campfire meal prep. Up front, the driver’s seat is well worn, but the passenger-side bucket is holding up well. The Dodge appears slightly rougher around the edges in this shot, and one of the exterior photos shows a door that doesn’t quite line up perfectly. I’m sure there are some minor quibbles to sort out, but for the price, which includes the aforementioned carb as well as a new exhaust, it’s hard to fault. Cool van, nasty interior makes me want to get a shower! 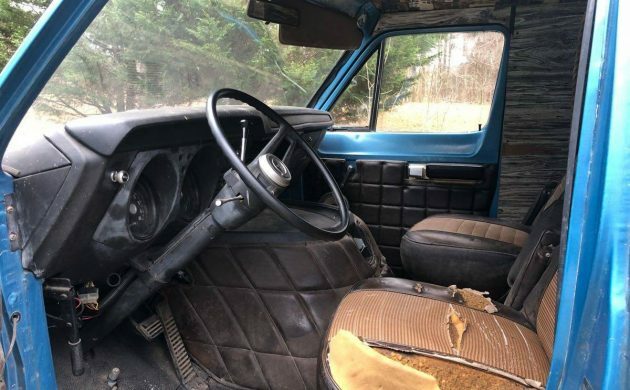 This van has lots of potential … The front seats are begging to get replaced with Captain’s chairs! I say this van is veeeeeeeerrrrrrrrrryyyyyyy…… I wonder what he would take for the chevelle??? 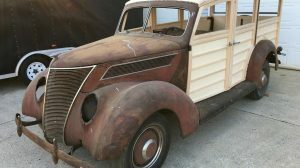 I grew up with a van from this era and would love to buy this one and deep clean it. Don’t dig the side pipes though. Excessive wear on the driver’s seat and little wear on the passenger seat indicates the van wasn’t the chick magnet the lonely owner hoped it would be. or the chicks just spent all their time in the rear …. If one observes this carriage swaying in a oscillating fashion, please refrain from announcing your presence to the occupants inside by striking your knuckle upon this door. It will be of no use. The salutations you seek will neither be entertained nor acknowledged by the entwined fornicators within said vehicle. I built a custom Dodge Maxi-van in high school in ’77. The dean hated me. (That was back in the days when you could actually leave school for lunch….) Funny, I paid $3700 for it, but it was only a year old. So I guess these aren’t exactly classics. 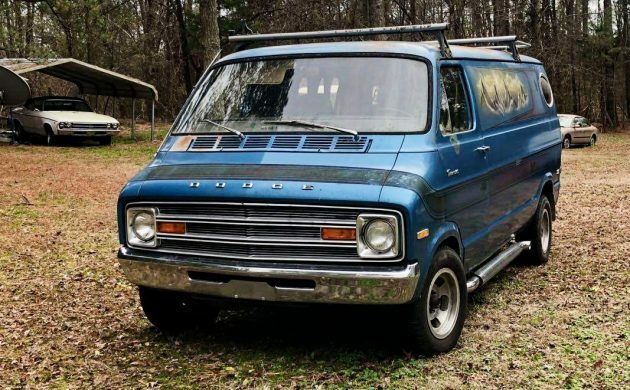 Nice original era Dodge van.I have a 72′ I bought new and have rust issues that I don’t see here. Must be kept under cover. Would love to buy it and put all my Goodies into it. I also have the “US Indy” wheels that I special ordered with the 8 bolt pattern and 15 “. 8.5 in the front and 10.0 in the rear, 340 with dana rear(B-300) auto, Sportsman Royal Maxi. The chrome bumpers and tag light here tell me he added them on later. Tradesman vans were all painted. It may have floor issues(stock rubber mats don’t do well) and the roof surfaces may have a slight rust problem(lack of paint), but the roof rails look great(hint under cover). Rear doors always leak that cause the roof rails to fail. Wish the van was closer, than I may consider on taking on this project. I had a 74 Dodge Shorty van, same color and I did the same home conversion but much better than this one. It was a nice van but the dealer could not figure out why the brakes would lock up at 65 mph on the interstate when I just touched them to slow down. I gave it back and they gave me a 70 GTO for what I had already paid. I made out on that deal. Has the original carpet too…. One thing I love about this site is the memories brought up seeing these cars. My father in law called me on Saturday morning and asked me to come right over. 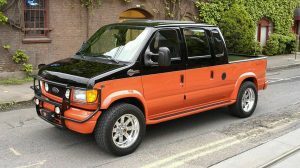 In his driveway was a plain white van just like this. He opened the door and it was empty inside! He said ” fill it up”. He bought anything i told him I needed and several weeks later the family had a great vacation van for those trips to the lake. I worked at a Dodge dealer in Toledo Ohio in 1974, and we sold Head Rest “Hippie Vans” built by Gerring. This was a pretty standard conversion with a modest mural. The vans were about $3000 and the conversion was about $2500. We had some with more detailed murals that we would sell for $6995, brand new in 1974. I sold one to Ian McFee who was a hockey player for the Toledo Roadrunners. It was a great time to be in the car business with custom vans and still a few muscle cars around. It was a bad time to be in the car business with the first OPEC oil embargo and long lines at the gas stations just to get 5 gallons of gas. We did have the first factory rebates with the Car Clearance Carnival. I remember Joe Garagiola being the pitchman on the commercials. I’m still selling new vans, an empty cargo van is $35,000 and a custom conversion is at $100,000 or more. We still have rebates too, they are just much bigger now a days. 1974 was another terrible year for Chrysler. I didn’t see any comment about the nylon timing gears they tried to use to cut costs in these engines. DTBorden, my understanding on the nylon teeth on the timing gear was to quite down the ticking in the motor. They were good for around 40,000 miles then would jump a tooth or two and then the popping would start or the motor would just shut down and you would hope you didn’t bend a valve. Anytime I had a motor apart I would change the timing set for a double tooth one (steel) that came with the 340 motors. Problem Solved!!!! Rock’nRoll and vans,Disco and vans, it’s all about the ladies. Yes Oldolds it was and that’s why when the parents found out I had a Van(1973) I was off limits. Funny thing was, it was the ladies that were aggressive.